We were leading Nancy’s high school camping club on a three-day autumn adventure. 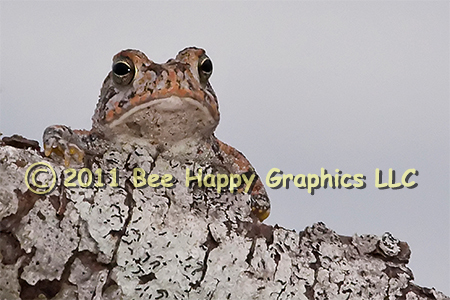 We saw this toad on our Sunday morning hike. 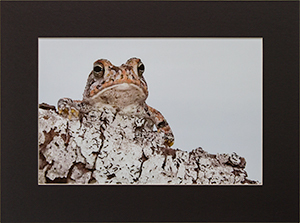 The oak toad is North America’s smallest toad. This one measured about an inch in length. We were impressed with how well it could blend into its environment. Although common to Florida and the southeast, it can’t be found in urban or suburban areas. Photographic details: Canon EOS 20D camera w/ EF 100-400mm f/4.5-5.6L IS USM lens set at 400mm. Flash was used. Camera was on f/29 for 1/250 sec at ISO 1600. Fine Art Paper 11" x 14" 121/2" x 19"
Canvas N/A 19" x 281/2"